Unusual ways to use glass in the home. Glass isn’t the first material you think of when you’re looking for bench top materials, but it’s worth thinking about. Glass can be a perfect bench top material. It’s strong and easy to clean. 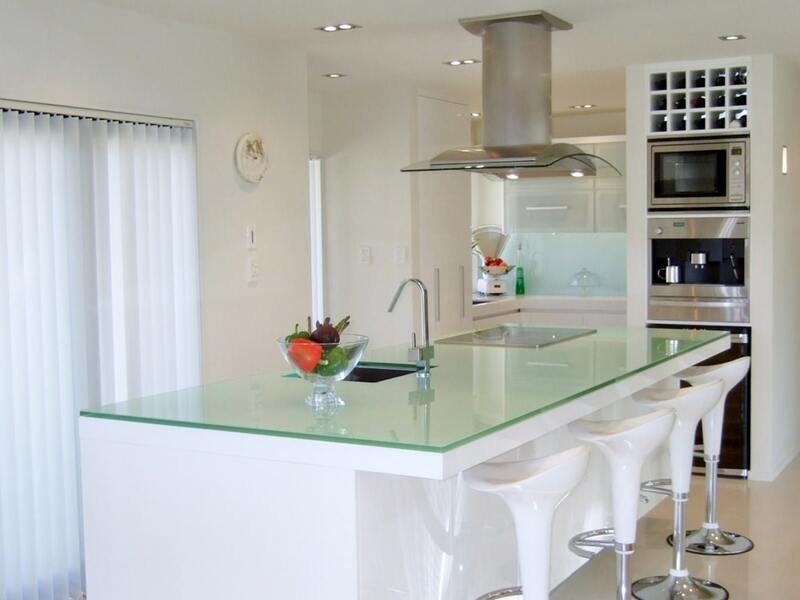 More importantly, glass bench tops have a certain elegance that can’t be matched by most other materials. It’s not for every kitchen or bathroom, but a glass bench top may be perfect for a modern kitchen or bathroom. Glass bricks are more common than glass furniture, but are often overlooked. They resonably inexpensive and you can use them anywhere you want light to enter a room, but don’t want clear glass. Glass bricks are hollow. This helps insulate the room against heat or cold transference into a room. You can even use them as an unusual, but stylish shower enclosure. Glass bricks aren’t confined to the bathroom. Use them in any room of the house where you want natural light, but also want privacy and insulation. For an even more dramatic effect, you can use colored glass bricks. Are you looking for a stunning finishing touch to your kitchen? This may be what you’re looking for. Glass splashbacks are more expensive than acrylic splashbacks, but they can be perfect for the kitchen. Glass fencing and glass balustrades are fairly common now. stair treads can be used just like timber treads. Use them on a straight or circular staircase. However you use them, they will be a stylish addition to your home.